In this issue of IJME, an editorial critically examines the draft National Health Policy 2015 and what the trends in policy making mean for the health of the Indian public. 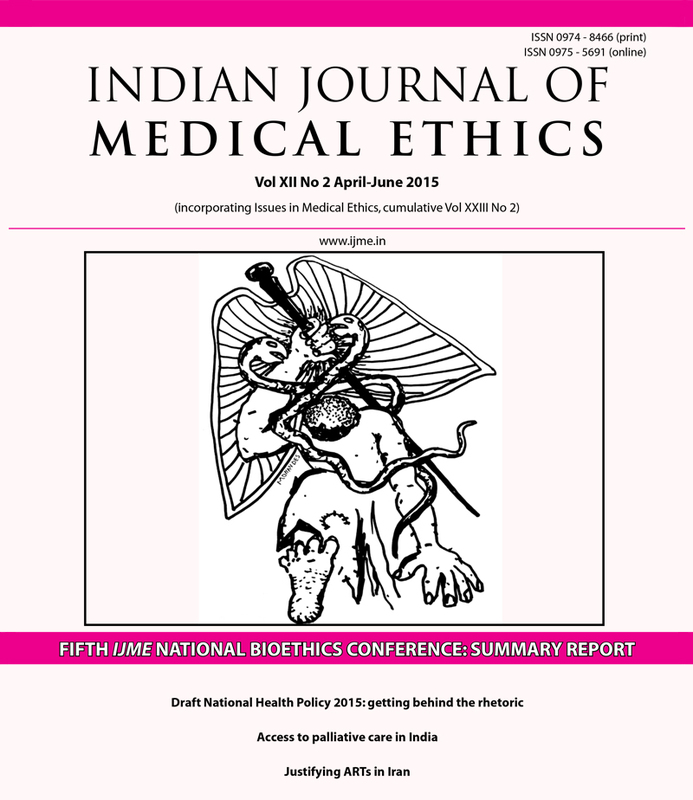 It also has the conference report of the Fifth IJME National Bioethics Conference. Osler’s great physician treated not the disease, but the patient who had the disease. How that patient views her doctors, rightly or wrongly; what she thinks of the research being done in her name, are focused on by the authors of an article in the issue. When that patient is in incurable pain, the only succour may come from pain medicine. Policies which facilitate access to such medicine are the subject of another article. A study examines the attitudes of medical students to plagiarism, with a view to building resistance against it. The long road to making ARTs accessible to couples in Iran is mapped by an article, while another asserts the need to step back from commercialisation and make medicine rational and affordable. An author looks at the pressure on doctors from public perceptions of them as professionals. All this, with interesting book and film reviews, and thoughtful letters from our enlightened readers make the issue a valuable one. The ethical healthcare community is a small, close-knit one, and we mourn the loss of a young and indispensable member, Dr Ajay Khare. Do medical students require education on issues related to plagiarism? Making medical care and research rational and affordable.